Should Silicon Valley shun Peter Thiel because he supports Donald Trump? Should Silicon Valley Tolerate Peter Thiel? Why the billionaire’s support of Donald Trump is dividing the tech industry. Peter Thiel speaks at the Republican National Convention on July 21 in Cleveland. In Silicon Valley, as the most divisive election of our time draws near, the burning question this week is not who to support for president. For most of the tech-industry hotbed, even its business elite, that was a foregone conclusion. Rather, the question roiling the tech community—spawning righteous Medium posts, calls for boycotts, and leaked internal memos from CEOs—is this: Should a prominent Donald Trump supporter be allowed to continue holding positions of power in the Valley? The Trump backer in question is Peter Thiel, the billionaire venture capitalist who co-founded PayPal and Palantir. Always an oddball in the Valley for his radical libertarian politics, Thiel has emerged as an unlikely Trump champion. He stumped for Trump at the Republican National Convention in July, and now he’s reportedly donating $1.25 million in support of his candidacy. This at a time when the candidate is trailing almost hopelessly in the polls and is under fire for allegedly making unwanted sexual advances on numerous women over the years. Why exactly Thiel is backing Trump so enthusiastically is unclear. It could be anything from his tax proposals to his views on security and defense to his defiant political incorrectness. (Thiel is the co-author of a noxious book called The Diversity Myth and is about as un-PC as it gets.) It could be that Trump shares Thiel’s taste for exacting revenge on the media. Maybe it’s a ploy for publicity and political influence. What is clear is that Thiel is sticking by Trump, and it’s utterly infuriating Valley progressives who find the candidate to be not only loathsome and dangerous but an instigator and an emblem of racism and sexism. Those progressives include Ellen Pao, the former Kleiner Perkins partner and Reddit CEO who co-founded Project Include to promote diversity in the tech industry. In a Medium post on Monday, Pao announced that Project Include is ending its partnership with Y Combinator, the famous startup incubator that Thiel joined as a part-time partner just last year. Thiel does not run Y Combinator, mind you; he’s merely an adviser. Y Combinator, for its part, has “openly acknowledged bias and harassment problems in tech, and it has made progress in diversity and inclusion in its own organization,” Pao allowed. Still, she found Thiel’s Trump support so contrary to Project Include’s values that his mere association with Y Combinator compelled her to discontinue the friendly relationship between the two organizations. So far, the principal Silicon Valley players in this debate, such as Pao and Altman, have kept their disagreements civil. “I always freely admit I may be wrong, and particularly in this case,” Altman tweeted. Pao wrote of Project Include’s break from Y Combinator, “We hope this situation changes, and that we are both willing to move forward together in the future.” In the media, however, the dustup has generated some overheated rhetoric from each side. 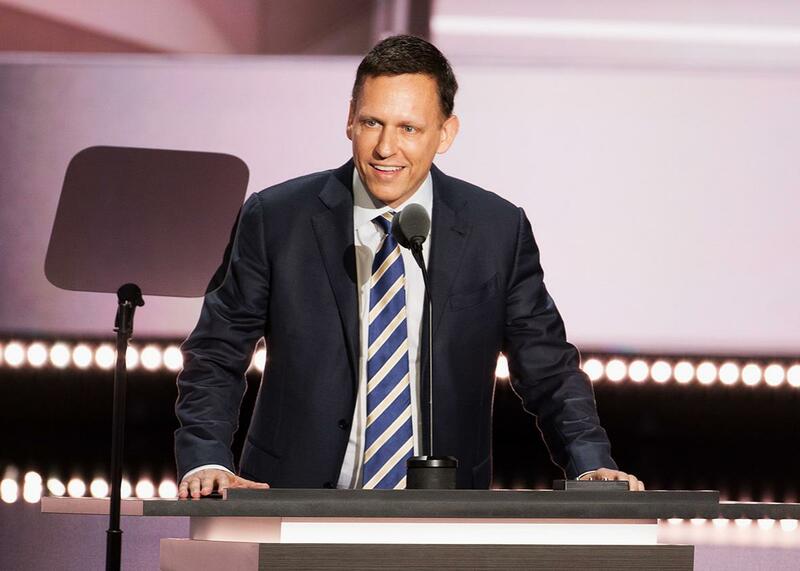 Pascal-Emmanuel Gobry, a conservative French journalist who opposes Trump, wrote a column for the Week denouncing Silicon Valley’s “shameful purging of Peter Thiel” and compared him with the Hollywood 10. The backlash against Thiel is hardly a “purge,” since he’s only one person. No one’s calling for every Trump supporter to be driven out of the Valley. And activists calling for a billionaire adviser and investor to lose a board seat or a part-time adviser position over his highly public political actions is a far cry from the systematic persecution of suspected communist sympathizers. On the other side, J.K. Trotter of Gizmodo—the tech blog that was salvaged by Univision from the wreckage of Gawker Media (along with five other sites)—has called for Altman himself to resign from Y Combinator. Slopes aren’t always as slippery as they seem, but the principle that even avowed Trump opponents are now unfit to lead Silicon Valley companies if they maintain ties with Thiel feels rather far-reaching. What’s at stake here, to be clear, is not the outcome of the election. At this point, Clinton is highly likely to win no matter what Thiel does for Trump. Even if she doesn’t, it’s almost impossible to imagine a scenario in which the U.S. presidency hinges on what Mark Zuckerberg or Sam Altman or Ellen Pao say or do about Peter Thiel. This debate has essentially zero bearing on who will lead the country in the coming years. That doesn’t mean it’s a moot issue, however. What’s really at stake—beyond the immediate implications for Thiel, Facebook, and the others directly involved—is the social and political ethos of Silicon Valley. Gobry notes that the region’s ascendance as a global economic engine has been fueled by “its tolerance for weirdos and wackadoodles of all kinds.” Steve Jobs was at once a ruthless capitalist and a dreamy mystic with poor hygiene. Elon Musk plans to retire on Mars and suspects we’re all just characters in some other life form’s computer simulation. Travis Kalanick digs Ayn Rand. Peter Thiel is a gay German American chess whiz who supports Donald Trump. Silicon Valley, in this view, ought to embrace them all, because crazy ideas are its lifeblood. Over the past decade, however, Silicon Valley’s self-conception as a haven for underdogs and dreamers of all stripes has been challenged by the awesome wealth and power that its leading figures and companies have managed to concentrate. Now that they control much of the world’s data, its means of online communication, and a growing share of its wealth, technology titans’ aversion to messy political disputes carries an undeniable political force of its own, from Bill Gates’ influence on U.S. education and global health policy to Facebook’s disavowal of editorial judgment in its trending news section. At the same time, Silicon Valley’s myths of meritocracy and tolerance have been undermined by critics who point to the overwhelming whiteness, maleness, and Ivy Leagueness of its brain trust. Zuckerberg cites "diversity" when defending Thiel's spot on Facebook's board. The real divide, then, is this: Insider Silicon Valley views political disputes as an impediment to creative thinking and a distraction from the business of innovation. Outsider Silicon Valley views the business of innovation as inherently political, and it regards the dismissal of politics as untenable in an industry whose products increasingly shape how we live and work. Insider Silicon Valley is a haven for the likes of Thiel. And that’s exactly what the outsiders think is wrong with the place. Should Silicon Valley tolerate Thiel? At the risk of being accused of false balance, I think there is a middle ground here. The critics are right that the personal and political values of Silicon Valley leaders matter deeply. They’re right that Thiel’s business acumen should not insulate him from scrutiny or opprobrium. To turn a blind eye to the politics of people such as Thiel; Kalanick; or Tom Perkins, who once suggested that the wealthy deserve more votes in U.S. elections than the poor, is to ignore the impact their ideas have on the world. Thiel should not be celebrated; he should be criticized. Trump is indeed stoking dangerous racial enmity, and his treatment of women is egregious. But to equate Thiel’s support of his candidacy to advocacy of hatred and violence, in the absence of evidence that Thiel actually advocates those things, is a leap. More importantly, it’s hard to see how Thiel’s donation to Trump renders him unfit for the specific positions he holds. Can no Trump backer offer business advice to startups or occupy a single seat on Facebook’s board? In Facebook’s case, especially, firing Thiel now might be not just unproductive but seriously counterproductive, further alienating the same conservatives whose alienation has fueled Trump’s rise. Silicon Valley’s progressives are right to call attention to Thiel’s politics and even to try to discredit him. If that leads Altman, Zuckerberg, and others to question his judgment and perhaps eventually decide they’re better off without him, all the better. But perhaps we can draw a line between denouncing Thiel and pressuring everyone who works with Thiel to excommunicate him. Even in this extraordinary election—maybe especially in this extraordinary election—calls to punish people who back the wrong presidential candidate should make us all a little queasy. Read more of Slate’s coverage of the 2016 election.